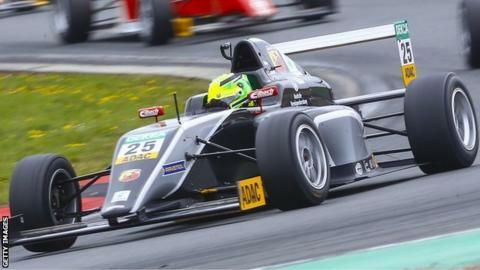 Mick Schumacher, the son of seven-time Formula 1 world champion Michael Schumacher, has won a Formula 4 race for the first time. The 16-year-old, competing in only his third race, claimed victory over the 18 laps at the Oschersleben track, between Hannover and Berlin in Germany. Schumacher Jr had come ninth and 12th in his first two F4 races before leading from the front to win. He drives for the Dutch Van Amersfoort Racing team in Europe's ADAC Formula 4. The season runs until October and his success comes only a day after he won the best rookie award having moved up from a starting position of 19th to finish ninth in his F4 debut. With Michael Schumacher still recovering from a serious head injury suffered during a skiing accident in December 2013, his son was watched by grandfather Rolf.